I’m always looking for ways to create on the fly and challenge myself to keep things interesting. Hi there, my name is May Flaum and I’m excited to be here as a guest on the Doodlebug blog today! As the mom of two girls and lover of bright crisp colors I’ve been a Doodlebug fan for many years and I always look forward to seeing what they’ll come up with next. The Stars & Stripes collection caught my attention right away, and I’ve been crafting up a storm with it! Today I have a new project to share with you here – made especially for this blog. My inspiration for this page was to use bits and pieces that I have left, as it seems I’ve crafted my way through most of my stash! No 12x12 sheets of patterned paper left? No problem! I cut up my chunks of leftover paper bits and made it work! You can see above how I cut apart and placed pieces, as well as adding in stickers, and even stitching some of the fantastic twine along the top edge. 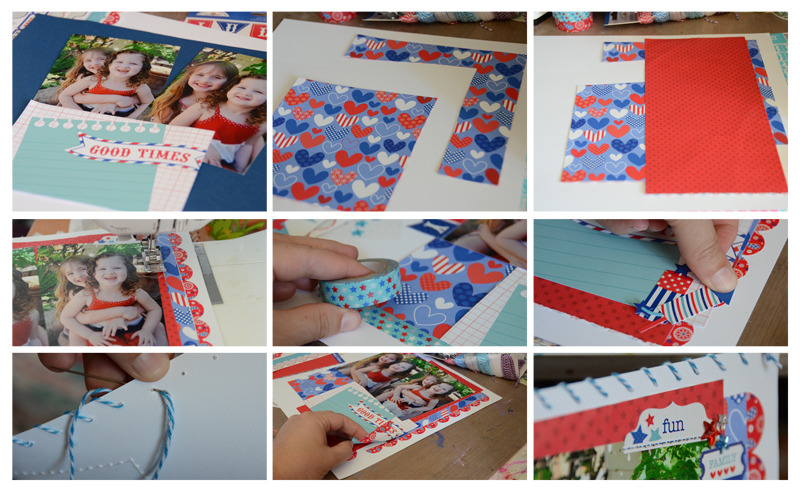 I love that all I needed to add in was a sheet of white cardstock and the Stars & Stripes collection did the rest! 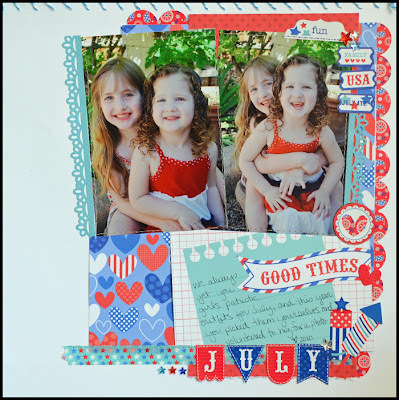 I mostly scrapbook with 4x6 photos, and this has me absolutely loving the Simply Put Album Inserts that doodlebug has! In fact I’m having such fun with these journaling papers that I’m almost all out! They work so well in my designs, and I love that they are double sided so you can have options depending on what your project needs. Whether you challenge yourself to use up leftovers on your desk as I have here today or simply take an hour (or even a half hour) to craft something soon I hope you enjoy some very happy crafting! If you’d like to see more of my craft projects I welcome you to visit me at my blog (www.mayflaum.com), and I also have a new workshop starting with Big Picture Classes June 6th called Camp Scrap. It’s all new material, more than 15 videos and 54 new and exclusive projects too. I play with all kinds of scrapbooking and paper crafts – it’s going to be four weeks of creative play and the best part is that the materials will remain up and available, so you can access at your own pace. What could be better? I’ve got a spot to give away to one of you lovely readers! Would you like to win free registration to join May's Camp Scrap class? Then it's simple, you can enter by doing one (or all) of the following. You will have until May 31st to enter. Winner will be announced on June 3rd. 1. Connect with May by following her on either Pinterest, Instagram, YouTube or Twitter. Then leave a comment telling us which one you are following her on. 2. Follow Doodlebug Design on Pinterest. Leave a comment you did or are already. 3. Leave a comment on the Doodlebug Facebook page telling us why you love Doodlebug. I already follow May's blog - there is so much good stuff to see there! I just started following May on Pinterest! My Pinterest name is Fredbugbear. Of course I follow my Doodlebugs on Pinterest and everywhere else I can find them. (I am a doodlebug stalker...) I also follow May on Pinterest. Love the layout!! I'm a follower of Doodlebug on Pinterest already! I am following May on Pinterest! I am following Doodlebug on Pinterest, too! I follow Doodlebug on Pinterest! I have followed Doodlebug on Pinterest since I first joined February of 2012. Love it!! I am following May Flaum on twitter! I am following May Flaum on Pinterest!!! I follow May on Pinterest and You Tube! I now follow May on YouTube. I'm now also following May's Pinterest board about Scrapbooking Trends. Now I'm following your Cards board on Pinterest. I follow May on Pinterest and Doodlebug! I am following May on Pinterest and her blog and Facebook. I am now following Doodlebug on Pinterest! I am following May and Doodlebug on Pinterest AND I commented on Doodlebug's FB page. Thank you for introducing me to May's blog and classes, I wish I knew about her sooner! Really great layout! I follow May and Doodlebug on Pinterest! I follow May and I follow Doodlebug! I follow May on Twitter. I already follow May on Pinterest and her blog. I now follow Doodlebug on Pinterest and left a comment on their Facebook page. Would love to win a spot in May's Camp Scrap. Took the first one and it was great! I follow May on Pinterest and her blog. I just signed in to follow Doodlebug on Pinterest. I left a comment on their Facebook page. I follow May on Pinterest and her blog. I follow May on Twitter, her blog and You tube and I follow you on Pintrest! I follow May on YouTube & her blog. I follow May on Pinterest and her blog. I now follow Doodlebug on pinterest and already leave a message on ther Facebook page. I would love to win a place in May´s class. Thanks so much for offering this giveaway! I'm now following both May and Doodlebug on Pinterest. I signed up to follow Doodlebug on Pinterest. I'm following May on Pinterest. I'm following May on Pinterest and following Doodlebug Design on Pinterest and left a comment of their facebook page. I have always followed and loved May on Youtube and her e-mails, blog. Love you May. I would love, love, love to be a part of Camp Scrap. Thank you. I am following Doodlebug on Pinterest. Love all your bright vivid colors. More Snips and Snails please. I follow May on Pinterest and Instagram and Twitter. Love your work May and would love to win a spot in Camp Scrap. Also just started following Doodlebug on Pinterest. Thanks! I follow doodlebug on pinterest and follow May's blog. I have followed May for a very long time - her blog, You Tube, Pinterest, Twitter, all of it. I do follow DoodleBug on Pinterest. I have been following May on Pinterest and Youtube. I currently follow May via her blog and Instagram, but I will be adding Pinterest. Thanks for the chance to win a spot in Camp Scrap! I just started following doodlebug on Pinterest and have been following May's blog for quite a while. I've been following May on her blog since Camp Scrap 2012. Great projects, follow on pinterest. Following May and Doodlebug on Pinterest. Love May's blog and was directed from there to yours. I am following May Flaum and Doodlebug on Pinterest. I also follow May on Twitter. And I have posted on Doodlebug's Facebook. Bring on the win for ScrapCamp!!! I mean to say now following hehehe! I already follow you on fb yay! I am a friend of May's on fb...and I follow all of her boards on Pinterest!!! I cannot tell you how thrilled I would be to win this class. I told Doodlebug on Facebook why I love them. Now following Doodlebug on Pinterest under amesari. Following May on Pinterest under amesari. Left a comment on FB. Thank you for this great chance! I follow Doodlebug on Pinterest and am a huge fan of your products. I love the bright and cheery colors of all of your collections! Thanks so much for the chance to win and have a great day! Would love a spot in this class, awesome! I am now following May's fab stuff on Pinterest. I already follow DB on pinterest! Love you guys! I told you how much I like you and why on your FB page! I am not following May on Pinterest! i already followed you on pintrest !! I'm a new FB liker and left a message about why I love Doodlebug!